3 Piece Sterling Silver Earring and Pendant Set Just $19.99 Down From $99.99 At Sears! You are here: Home / Great Deals / 3 Piece Sterling Silver Earring and Pendant Set Just $19.99 Down From $99.99 At Sears! Sears has this beautiful 3 Piece Sterling Silver Earring and Pendant Set on sale for $19.99 (Reg. $99.99)! 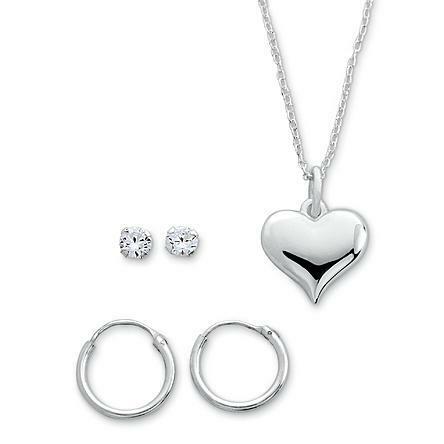 This is a 3 piece sterling silver set with a pair of clear stud earrings, hoop earrings, and heart shaped pendant.